The Kaldi Wide comes with an analog dial thermometer that works well and is sufficient for roasting. I did four dozen roasts with it. But I thought Iâ€™d try adding a new probe and meter to get a digital readout. The factory issue thermometer is easily unscrewed. I planned to use the same location for the new probe. I found two challenges. First: you need a probe thatâ€™s long enough. One internet reference led me to a probe from a source related to Sweet Marias; but once in hand, it proved too short, since I wanted to get a reading inside where the beans are, not just the exhaust gas temp. And it had to be a probe which can take the heat not just at the tip, but for several inches that are inside the roaster. The best match I could find was a bit longer than ideal, but it would work: Uxcell a15063000ux0338 10' Stainless Steel Probe K type Sensor High Temperature Thermocouple, $13 at Amazon. Second: you want a way to secure the probe well in the original opening. For those of us in non-metric land (USA), the challenge was to find something which would screw into the original threads, preferably with a hole thru the center that wouldnâ€™t have to be drilled out. I located an inexpensive spark plug with the right metric diameter and thread pitch: NKG 3932 DCPR7E, $3 at Amazon. Once you cut the spark plug in half and remove the ceramic core and wire (wear eye protection), youâ€™re left with a perfectly threaded hollow cylinder. Since the probe was a bit too long, I scrounged the shop parts bins and found a couple spacers: air hose connectors which fit close enough, especially after a bit of grinding on one fitting so theyâ€™d nest better. Any spacer that fits well and has the right length would work. Electrical tape holds things together. Now the new probe tip sits just as far into the roasting drum as the original one did. The meter is a Mastech MS6500: $16 on Amazon. Trying out the new setup, it was surprising how much easier it is to grab 30-second readings for the roasting log. With the original analog dial scale, it took good light, close reading, thinking and computing to get the interpolations right. And sometimes I did it wrong. In comparison, the digital readout is a refreshing breeze, easy to instantly read, no errors. Iâ€™m guessing that the new thermometer has less time lag. The old one had some stiction, this one doesnâ€™t. The easy-read benefit alone makes the upgrade well worthwhile in my eyes. I recommend it. I wasn't able to get the other 4 photos to post; but I'll try to attach one of them below. What is the name of the pieces in the picture, tu search locally? 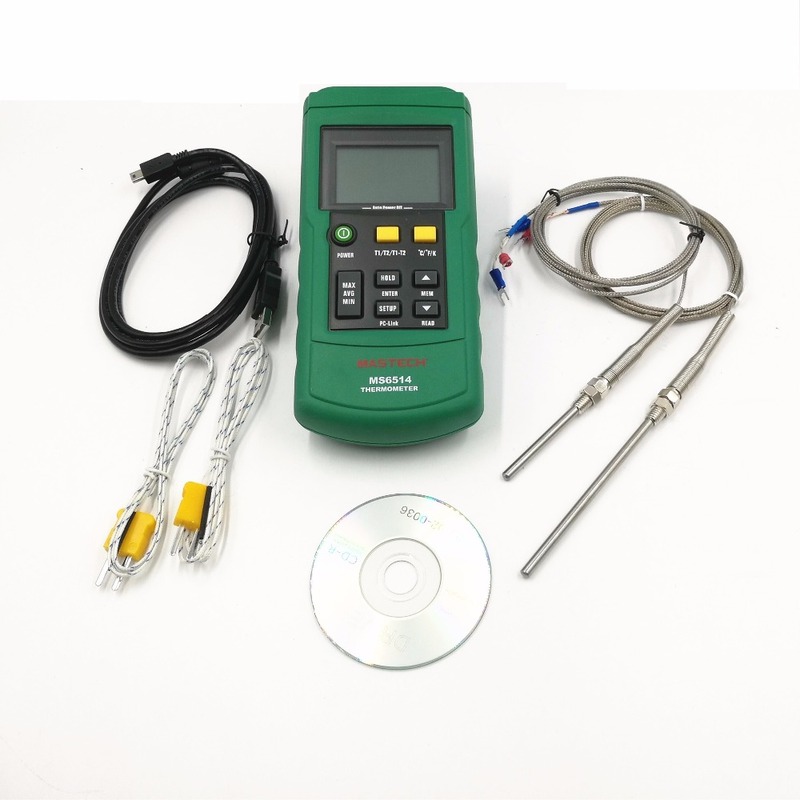 You can get a MS6514, dual temp, so you can have also ET, and the most important, they are selling now with two additional probes, 50 and 100 mm. In that photo, the sliver part on the left is the spark plug after being cut in half, and the inner core removed. That's the piece that threads nicely into the socket in the Kaldi Wide, where the original dial thermometer was mounted. The top of the photo shows the parts mostly separated. The bottom image is the parts pushed together, with the new probe running thru them. Unfortunately they don't bolt/screw together, but it tapes up good enough. The blue nut at top left I'd purchased at a local hardware store, to fit the spark plug thread, in case I needed it. But it turned out to be unnecessary for the parts lengths I used. Regarding the silver colored part in the middle, note that it has a bit of a ring close to the right end. I had to file it down a bit so the brass piece to its right would just barely slip over it. That made the assembly sturdier. I got a little tube of high temp silicone to "glue" everything together, but didn't find it necessary, it's pretty firm with just black electrical tape wrapped on the outside. Regarding probe length, that kit you found has two nice looking heat-resistant probes; but I think you'll find that 100mm is too short. While the 200 I used is longer than ideal, it was the closest I could find which was long enough. Hence, the spacers.